We were delighted to be awarded ‘highly commended’ (aka Runner Up!) in the wedding video category for the Devon and Cornwall Wedding Awards in 2018. We’ve been lucky enough to win in previous years, and exciting as it is to be awarded the little plaques and go up on stage – but that’s not our favourite bit…. Our favourite bit is when we get the full client comments (that were included with every vote) – it makes us a bit teary every year! We don’t know who left this one! But a huge, huge, HUGE thank you to whoever did! We don’t often know which of our couples left the quotes (they’re all anonymous). And this is one of those – a wonderful, heartfelt comment, and we don’t know who to thank! “Chris at Babalu was a pleasure to work with from start to finish. He’s extremely personable and really great to work with. On the day itself, Chris and his colleague Luke were great. They didn’t interfere at all, you wouldn’t know that they were there (which was great, as we aren’t the most comfortable in front of a camera!) they were very well dressed and were on hand to help. The highlight film is absolutely incredible. We’ve had so many comments that it’s the best people have seen. The quality is amazing, and it tells the story of our day in 6 minutes. We absolutely love it! The feature film is also incredible. The quality is wonderful and is the perfect way to relive our day. Babalu films aren’t cheap – their best package is at the higher end of the scale, but it was worth every penny. It was the best money we spent. We can’t thank Babalu films and Chris enough. 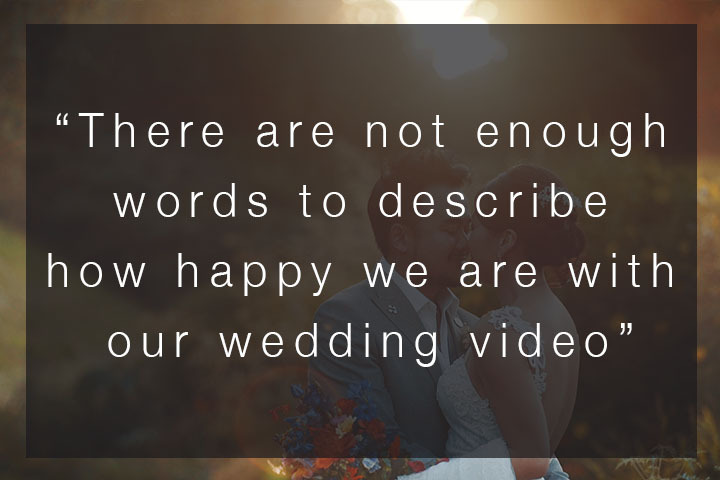 There are not enough words to describe how happy we are with our wedding video – Chris and his team are simply fantastic! From booking to the actual wedding day nothing was too much trouble for him and his team. We barely knew they were there on the day of the wedding and the shots they have were just fantastic. Everyone who has seen our highlight reel is in awe and needless to say many tears of joy have been shed.